4-Word Review: Lonely little island retreat. This is an intriguing film that seems quite similar to Roman Polanski’s Cul-De-Sac. Both films have a unique atmosphere and take place in a remote island setting and deal with a turbulent undercurrent that brews just underneath its deceivingly placid exterior. Here we have Andreas (Max Von Sydow) living a lonely existence on an island retreat. He meets, by chance, Anna (Liv Ullmann) who is still grieving from the death of her first husband. The two form a tenuous relationship that slowly unravels as the dark corners of their personalities are eventually exposed. In many ways this film has all the right ingredients. It wraps you up in its surreal nature and adds interesting effects. There are some creepy elements including a mad killer running around the island killing and torturing all the animals. Things work at a deliberate pace and leave no clue as to where it is headed. The characters are unpretentious and introspective. They are open about their faults and failures and give good reason as to why they have them. There are also fascinating cutaways to the actors themselves who help explain and interpret their characters motivations, which is a novel idea that gives the viewer a deeper understanding of the characters and adds an extra dimension. Unfortunately it doesn’t come together and leaves no real emotional impact. There are a few good twists, but you can’t help but feel that it should have gone farther. There a certain scenarios that get touched on, but are never explored. For instance there is Andreas’s relationship with Elis (Erland Josephson). Andreas has taken a loan out from him, but has also had an affair with his wife. This of course has some potential for fireworks and there is a moment where it begins to sizzle, but it never goes back to it. The same thing can be said for many of the other segments including the identity and reason for the animal killer. Overall this is an outstanding experimental-like movie. 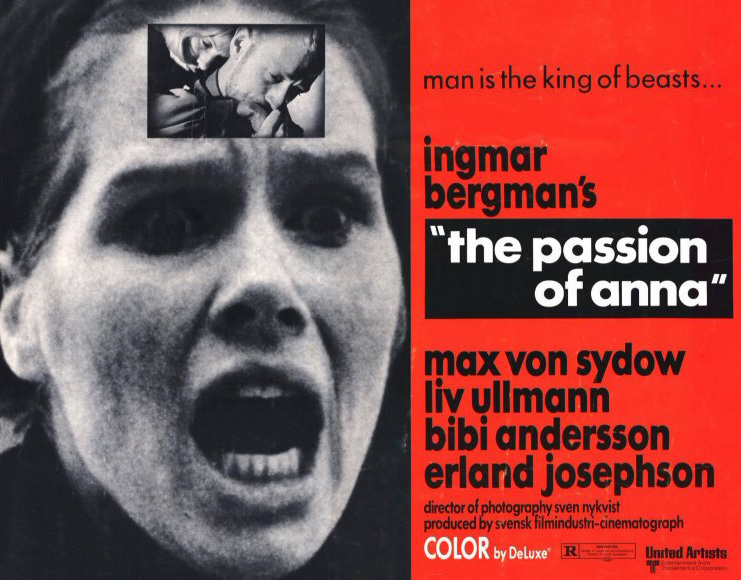 It is not one of director Ingmar Bergman’s best, but it is still richer and more deeply textured than eighty percent of the other movies that are out there. The crisp and revealing dialogue alone makes it worth it and Bergman displays the most realistic perspective on the union of marriage. This entry was posted in 60's Movies, Drama, Foreign Films, Moody/Stylish, Movies with a rural setting, Offbeat, Psychological, Surreal/Fantasy and tagged 60's Movies, Entertainment, Foreign Films, Movies, Review. Bookmark the permalink.